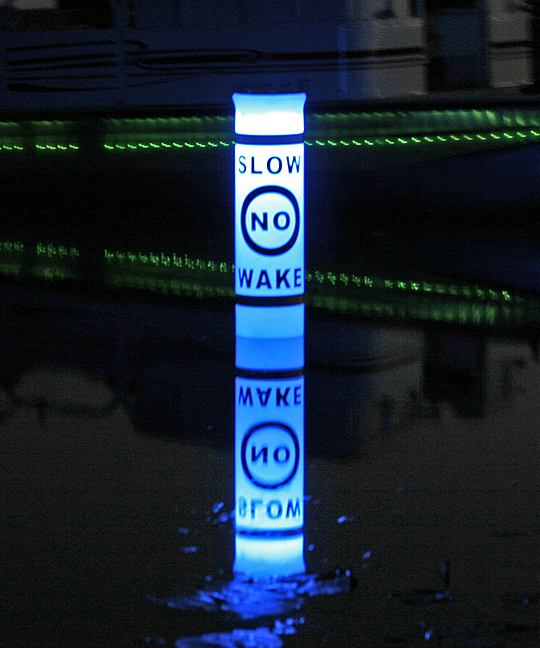 Our Solar Powered Illuminated Pencil Buoys work day and night, with solar lights that let the buoys and messages on them clearly visible from as far as one to two nautical miles, depending on weather and brightness settings. When you purchase the buoy(s), pick from 31 different messages. After purchase: choose between three LED colors (white, blue or amber), six brightness levels (and an off setting) and operating/run times for maximum flexibility. During the day, a powerful solar panel collects the energy, storing it in rechargeable batteries. 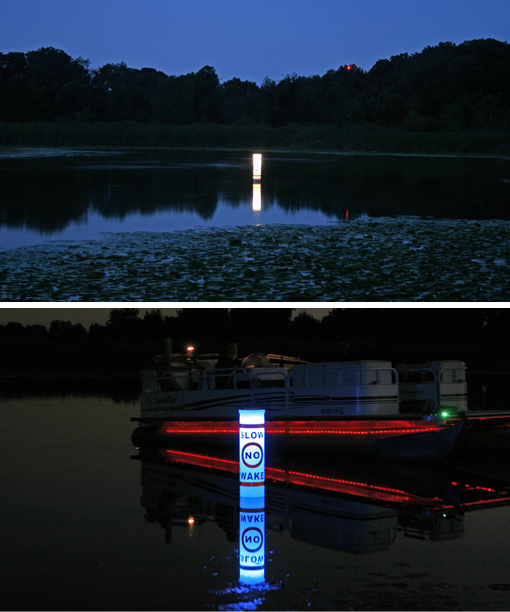 At night, integrated circuit automatically turns on the buoy’s internal light: illuminating the entire above water area of the buoy. 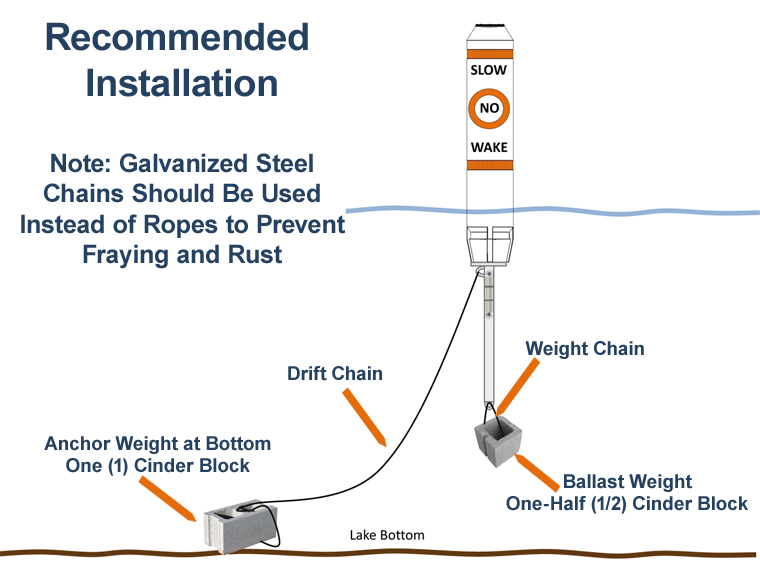 The solar illuminated buoy is 10 inches wide and 47 inches tall, excluding ballast pole. In addition to being set as a floating buoy, it can also be mounted to serve as a fixed navigation signal. It can be mounted on any pier or flat surface that is at least 8 inches in diameter. 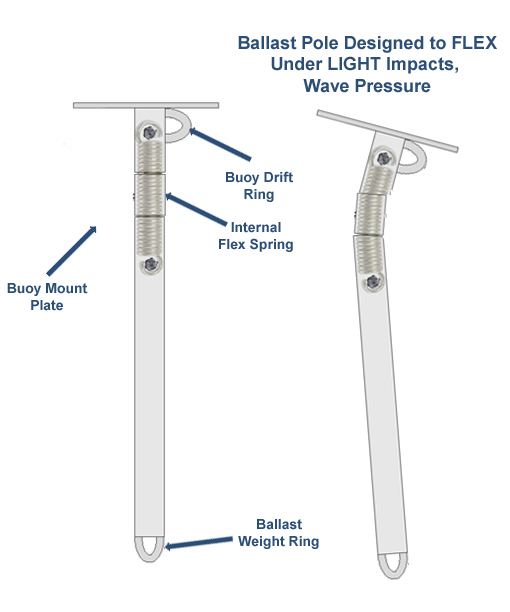 The buoy is made of rotationally molded polyethelene for uniform thickness and durability. It is designed to resist cracking and breakage from both collisions and harsh environment conditions including waves, hale and winds. 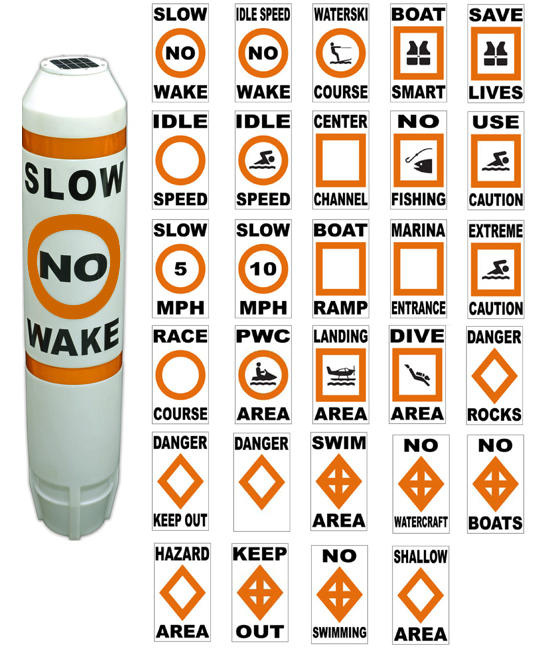 Each buoy comes with high reflective labels, bands and symbols that can clearly be seen day and night. 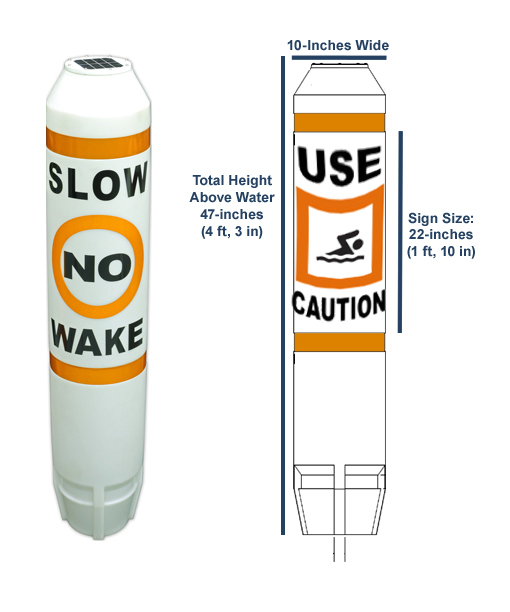 The color-fast labels create shadows that allow boaters and swimmers to clearly read the buoy message day and night. Settings: Choose Light Colors, Run-Times and Brightness with a Simple Swipe of Your Hand! As with ALL solar lights, operating/run times will vary depending on season, cloud/sun cover, latitude and to lesser degee temperature. A powerful 4 watt solar panel stores enough energy to allow all-night run-times most seasons of the year, even on cloudy days. Changing colors or brightness is easy with magnet technology that lets you hold or swipe an included magnetic “switch” over the solar panel to get the color, brightness and/or run times you want. Swiping the included magnet over the top of the solar panel lets you choose the brightness level/run times; holding the magnet over the solar panel for five seconds changes the color. No need to remove the buoy from the water: a simple wave of your hand will lets you change the color and brightness settings / operating times in seconds. For example, you may wish to set the brightness to 100% or 80% during the summer when days are far longer than nights. 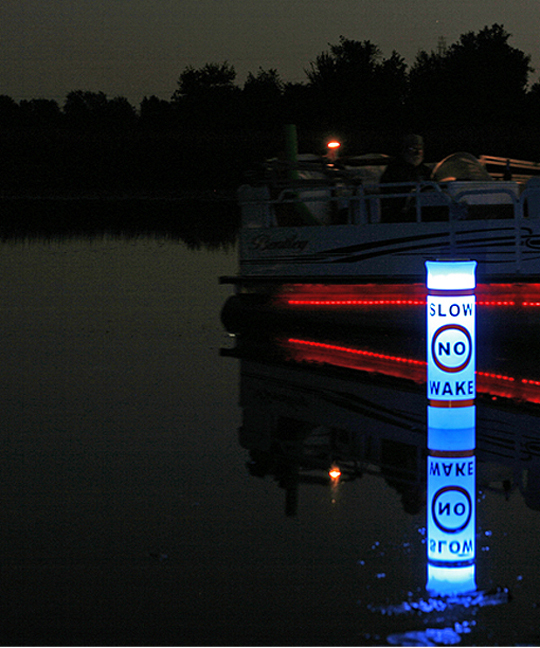 A lower brightness setting would provide true "dusk to dawn" lighting during spring and fall when waterways are used for boating and fishing during pre-dawn hours.